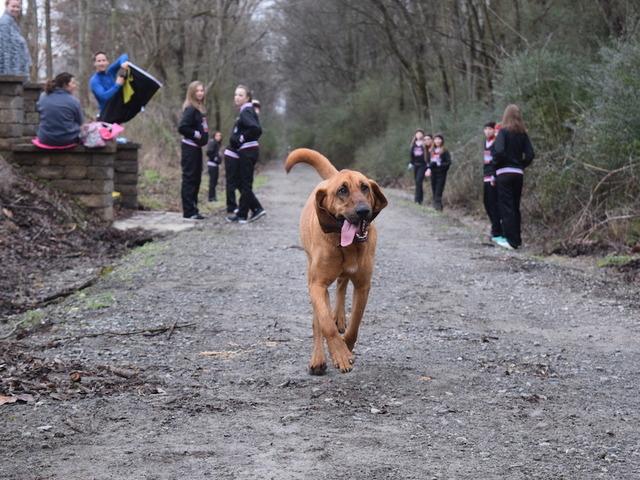 The 2016 Elkmont Half Marathon in Alabama went to the dogs — or just one, to be precise. A bloodhound named Ludivane accidentally joined the race and finished seventh. The dog easily stole the headlines after the race last Sunday. According to the group behind the race, Ludivane finished with a time of 1.32.56 and even earned a medal for her effort. "(Ludivane) started fast, in second place at the 0.5-mile (mark)," race witness Gregg Gelmis wrote online . "The next time we saw her was at eight miles ... by this time she had fallen back to fourth place, but still looked good." Atlanta's WSB-TV reported that Ludivane joined the race after her owner let her outside in the yard. The dog apparently saw the runners and decided to take off and join them. Take a look below at Ludivane in all her glory during the race.